GIVE YOUR ASSETS AN IDENTITY AND LOCATION! Bicycles have a similar identity crisis to vehicles in that they have only 1 VIN or Serial number identifier. This issue is further compounded as there is no centralised database to capture this information and link it to owners. Thus the trade in new bicycles and second hand bicycles is completely open to criminal enterprise. Thieves are quick to swop or exchange parts on a bicycle after it has been stolen, altering its appearance and make-up, and making identification impossible by the owner or the police. It is a requirement in terms of the Second Hand Goods Act that when a bicycle is traded that the true identity of the bicycle must be recorded by the Second Hand dealer, and the Act requires that any distinguishing mark (such as the serial number and / or microdot number) must be recorded. 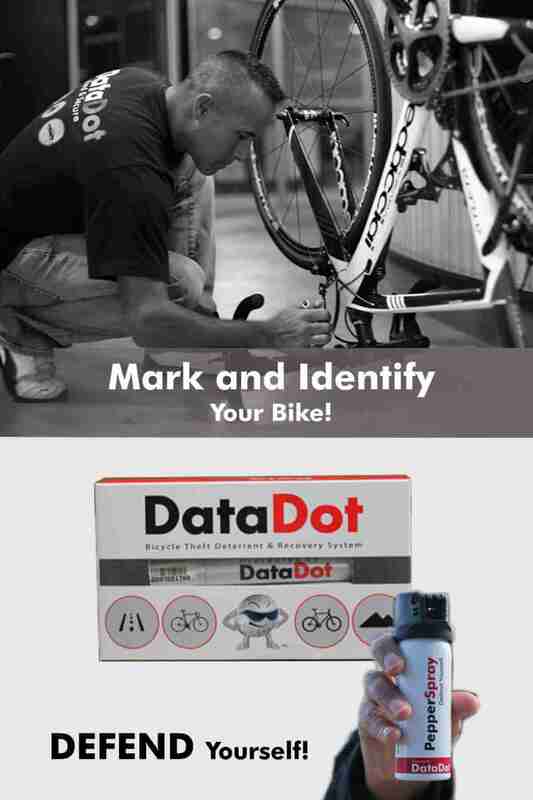 The DataDot solution for bicycles assists the owner of the bicycles in securing its identity, assists the police in identifying the true owner of the bicycle and prosecuting the thieves and enables the second hand dealers to be compliant with the law. Our DataDot Secure Bicycle Pen gives a unique identity to the bike. The Secure Bicycle Pen is a swab-on application process. Each kit is used to mark one bicycle to give it a unique identity that can be linked to the owner. Asset protection, identification and recovery is still a main concern for the mining sector, with loss of assets and product having a direct negative impact on the sector. By securing the identity of assets through the use of our technology the mine is able to positively identify the asset should it be stolen. During the maintenance stage at mines these assets that are not being used daily are at greater risk. Secure the identity and ensure that you know the location of the asset. Use our solutions! Asset management solution - Receiving daily confirmation of the location of high value assets that should remain stationery, such as generators. Should the asset be moved then notification and live tracking is activated. The agricultural sector is vital to the growth of the economy of South Africa and to continue in feeding and sustaining the ever-growing population. Farmers face environmental and climate changes which impact on their crop and production outputs, thus they cannot further be challenged with crop and equipment losses due to crime. DataDot Technology SA has various solutions aimed at assisting the agricultural sector and the farming communities in protecting their assets and crops from theft and other criminal activities. The market of stolen goods thrives on assets being unidentifiable and therefore not being able to be authenticated and identified and linked to the rightful owner. When farming tools and equipment are stolen, proving that the asset belongs to the owner is not always possible resulting in the stolen assets never being returned. Insured assets are replaced but Insurance costs increase, and the thieves are never identified and prosecuted. Farms in various parts of South Africa are large, and thus equipment and tools are placed at various positions on the farm out of the constant watchful eye of the farmer making these susceptible to theft. Crops and livestock are being stolen out of the orchards and fields creating substantial losses to the farmer, and often causing damage to the trees that are required to bear more crops. Microdot technology to mark the equipment and tools with uniquely coded microdots that are microscopic together with an advanced adhesive encoded with nanotechnology. Crop marking using nanotechnology with adhesive, and in some cases microdots as well. Authentication solutions to counteract counterfeiting of seeds and produce. 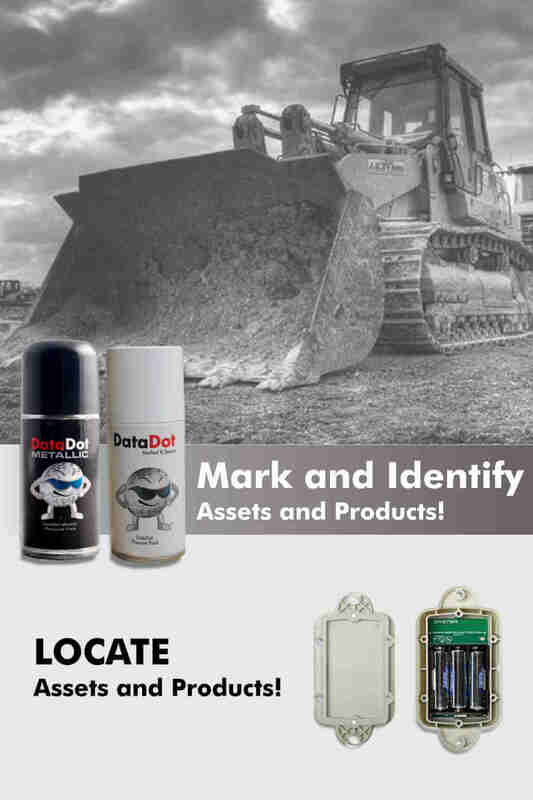 A Telematics device for assets that are usually in a fixed location providing an alert if this item is moved and to have peace of mind as to the location of the asset. This device has no installation requirements. When trading in replacement parts for vehicles and equipment, do you know if these parts are from stolen or hi-jacked vehicles? When you have your car repaired through an insurance claim are genuine parts being fitted as per your insurance claim? Hi-jacked and stolen vehicles are taken apart and their parts are sold into the second-hand market. We have identified parts from stolen and hi-jacked vehicles with the use of microdots. More than 50% of the vehicles on South African roads are not microdotted. This creates an opportunity for criminals to trade in stolen parts. In terms of the Second-Hand Goods Act the microdot details must be recorded when second hand parts are traded - Make sure you are compliant with the law! Our parts marking solutions are designed and customised to meet the needs of the parts suppliers, insurance institutions and vehicle manufacturers. The market of stolen goods thrives on parts being unidentifiable and therefore not being able to be authenticated and identified and linked to the rightful owner. 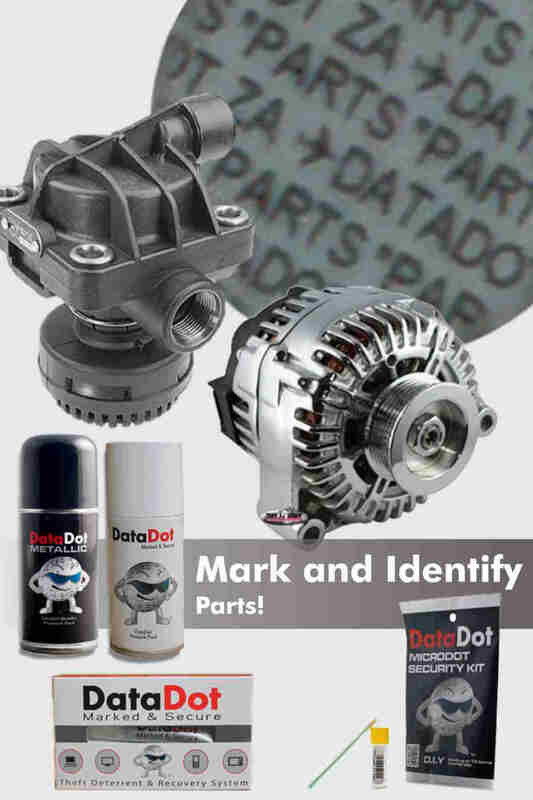 DataDot ensures that your parts have a unique identity by marking them with microscopic microdots that each contain a unique Pin number, giving an identity that can be linked to the rightful owner. All businesses - Corporate and SME's - are affected by theft with often disastrous consequences. In addition, a struggling economy increases the temptation to steal. Despite efforts to secure assets the number of incidences are increasing and often take a long time to be discovered. There are obviously many solutions that a business can investigate and put in place, but perhaps one of the most effective is microdotting. Home burglary can be expensive, inconvenient and even frightening. That's why it's essential to take appropriate measures to protect your valuable belongings. Thieves have been able to remove the identity of the assets by removing serial numbers and the like, however our solutions are covert in nature thus securing the true identity of the assets. It has also been confirmed that when police are able to identify the owner of the asset that this information provides powerful information to link various other crimes such as housebreaking, assault and other crimes to the thieves as the police are able to link the thief to the scene of the crime. 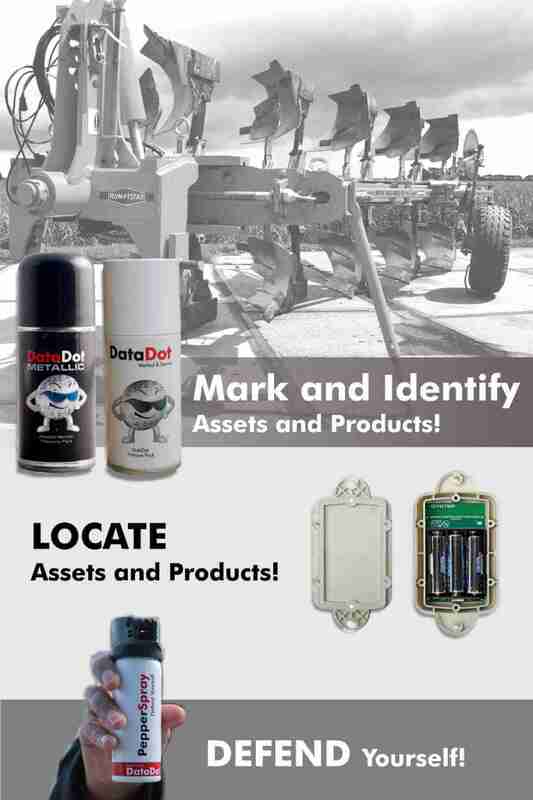 DataDot products are technologically advanced, easy to apply and cost effective, DataDot is the number one option for your theft prevention needs. The market of stolen goods thrives on assets being unidentifiable and therefore not being able to be authenticated and identified and linked to the rightful owner. Insured assets are replaced but Insurance costs increase. 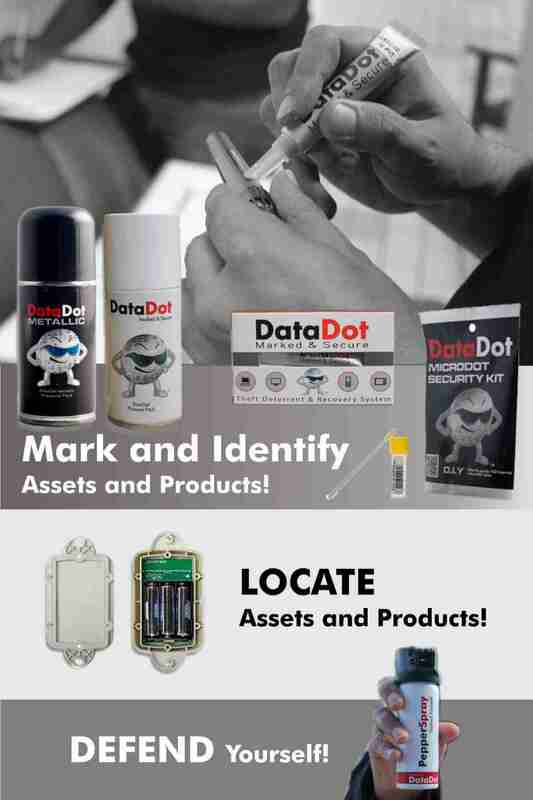 DataDot ensures that all your valuable assets have a unique identity by marking assets with microdots that are 0.5m in size - each DataDot has a unique Pin number, giving assets an identity that can be linked to the rightful owner. It's virtually impossible to locate and remove all the microdots, making it extremely difficult for thieves to sell assets without fear of being caught.